Hilton is pleased to announce that Markus Kosch has been named General Manager for the new Conrad Guangzhou, set to open in mid-2017. 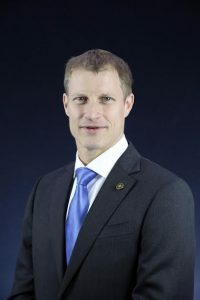 A veteran hotelier with decades of international experience with Hilton and specifically in China, Mr. Kosch is uniquely qualified to lead the opening team in delivering the region’s first Conrad Hotel. Conrad Guangzhou is a stylish urban oasis overlooking the Pearl River in the heart of CBD Zhujiang New Town. Offering 309 modern guest rooms and suites in an elegant 27-story riverfront tower along with intuitive amenities and flawless service, Conrad Guangzhou is the ideal basecamp for leisure and business travelers alike who want to explore, do business and stay inspired. The child of diplomatic parents who traveled the world, Mr. Kosch was groomed to serve in the hospitality industry. He was born in Venezuela and raised in Germany and Spain, where he developed impeccable language skills and cultural fluency. He attended hotel management school before moving to China to join Hilton with his first assignment at the Hilton Shanghai in the Room Division Front Office. Mr. Kosch polished his considerable communications skills while gaining expertise in management and operations as worked in positions of increasing responsibility within Hilton’s worldwide network. Over the past two decades, he has served Hilton in the Maldives as well as Chinese locations in Shanghai, Nanjing, Beijing, Hefei, Shenzhen, Sanya and Dalian. For the past five years, Kosch served Hilton as a Cluster General Manager for multi-properties, becoming adept at delivering two Hilton brand experiences at once. In Sanya-Haitang Bay, he managed the Conrad and DoubleTree by Hilton Resorts and, most recently, he managed the Conrad and Hilton Dalian. Conrad Guangzhou is located at No.222 Xing Min Road, Zhujiang New Town in Guangzhou. For more information or to make reservations, please visit the hotel’s website at www.conradguangzhou.conradhotels.com or follow the hotel on Wechat: Conradguangzhou.